TVXQ have released a colorful outdoor pictorial. LG Fashion’s French outdoor brand Lafuma has come together with TVXQ for their Summer pictorial. U-Know Yunho, who has been recognized as an actor for his role in SBS’ Monday-Tuesday drama ‘Queen of Ambition’, and Max Changmin, who is loved for his role in the KBS variety show ‘Our Neighborhood’s Master’, showcased their masculine charm in the new photos. TVXQ’s newest pictorial differed from the dynamic one they released in Spring with a complete Summer outdoor look of thin jackets, shorts, backpacks and trekking shoes. The colorful jackets drew everyone’s attention for accentuating U-Know Yunho and Max Changmin’s chiseled bodies. It was later said that TVXQ were professional at their photoshoot with Park Seul Gi, who was the runner-up in ‘Challenge! Super Model Korea 2’. 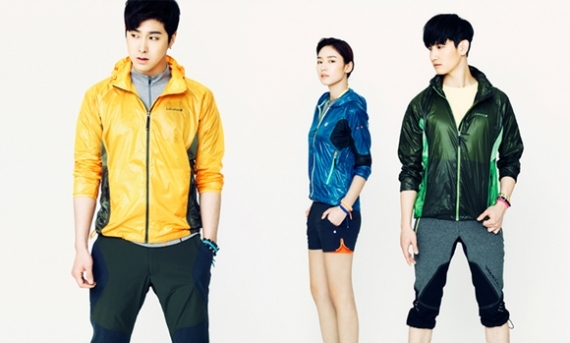 The jackets TVXQ wore for the pictorial are special lightweight jackets that protect the wearer from the wind. Meanwhile, TVXQ have been focusing on their overseas activities with their world tour and Japanese album ‘TIME’ promotions and will be releasing their Lafuma Summer pictorial in the May edition of ‘Singles’.